Wax-based and readily biodegradable: Euperlan OP White and Cegesoft Peel. At SCS Formulate on 13 & 14 November in Coventry, BASF will share stand 500 with its European distribution organization BTC Europe and present the latest solutions to meet the demands of the personal care market. BASF Care Creations will showcase two new products that answer the needs of today’s environmentally conscious consumers. “We are constantly seeking innovative and more sustainable solutions for the personal care industry. Consumer trends and needs clearly show us the way. With our new ingredients Euperlan OP White and Cegesoft Peel we can help our customers to develop winning products supporting both the consumers’ well-being and eco-conscience,” said Dirk Mampe, Vice President Business Management Personal Care Solutions Europe. Euperlan OP White is a wax-based, readily biodegradable and cold processable opacifier dispersion with a superior white appearance for surfactant formulations. The product meets today’s demand for ecological friendly ingredients and its unique properties make it particularly suitable for eco-label conforming skin and hair cleansing formulations. BASF is the leading supplier of cold processable wax dispersions for personal care that provide optical effects in rinse off products. Euperlan OP White complements BASF’s current portfolio of pearlizing wax dispersions and can be used as an alternative to synthetic polymeric opacifiers. Cegesoft Peel consists of round wax beads that provide a gentle and mild exfoliation. Mainly derived from natural and renewable resources, Cegesoft Peel is a readily biodegradable and environmentally friendly alternative to sharp-edged abrasives and non-degradable beads (often referred to as microplastic beads). Daily stresses are known to translate into cutaneous stress, with cortisol as its main mediator. Hyalurosmooth represses the damaging impact of cortisol on the skin, restoring collagen type I and hyaluronic acid that are affected. Bringing the positive effects of a mindful lifestyle – rested from the inside – Hyalurosmooth helps the skin recover its hydration and radiance. Extracted from the Indian Cassia angustifolia, Hyalurosmooth is IECIC-listed. As part of the Inspire presentation program, Axel Boettcher from BTC Europe will be presenting new data on Hyalurosmooth. Expansions will help meet an increase in customer projects; a second extension is in the final planning stage. Will provide new expertise and capabilities in one of the fastest-growing areas of healthcare. The Aquacoat product line provides modified release drug profiles with the added benefit of global regulatory acceptance. 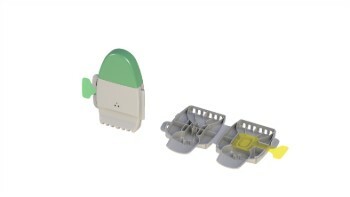 The Papillon DPI is a single-part, blister-based, reusable inhaler, suitable for both chronic and acute treatments. The loan will be used to develop KERUS Cloud - currently the only software that can simulate trials with multiple correlated outcomes - by integrating it into an intelligent software ecosystem. Catalent’s two Shanghai locations will provide sponsors with an optimized supply solution for studies being undertaken in China, the Asia-Pacific region and globally. Initiative will enable Sirio Pharma to keep abreast of regional trends, new ingredients, dosage forms and claims to provide customers unique product ideas for line extensions. Offers an alternative to cross-adsorbed secondary antibodies when absolute specificity is required. The acquisition will enhance the CDMO's chemistry development capabilities to support pre-clinical and early phase clinical supply. New guidelines will see poorer quality manufacturers drop out of the market. © 2017 cphi-online.com. All rights reserved.